A never-ending challenge for a medical billing company is to successfully manage the day-to-day administrative operations. However, their several efforts do not alter the abatement of claim denials, which leads to revenue loss, underpayments, etc. Most part of the cash goes to claims processing, payments, medical billing, revenue cycle management (RCM), and follow-up on bad debts, all because of a disorganized healthcare administrative operation. At Outsource2india, we can help you establish a healthy bottom-line, with least possible medical billing and coding errors through our extensive healthcare back-office support services. In the healthcare sector, the back-office activities are executed through a common method, the agenda is mostly to improve the clinical payoffs, train the clinicians, and a host of other non-clinical staff. Nowadays, a patient's experience can reflect a lot on a hospital's goodwill and reputation. This requires a tight grip on the administrative operations. However, the other non-medical services like insurance verification, billing, financial counseling, follow-ups, collections, payments, etc., fall under the provider's revenue cycle. This leads to discrepancies between back-end system records and the expected outcome. 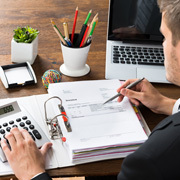 Revenue cycle management is a major aspect that drains a lot of time & skills. At O2I, we are equipped with 200 + healthcare support executives and efficient revenue cycle management tools to accurately record, safe-keep, and dispatch claim settlements and procedures. Our revenue cycle management support services can help manage your organization's claims, generate revenue, and processing the payments from a patient's appointment with his/her account closure. With us, you can get access to quality medical billing, while reducing your current operating costs by at least 40%. Our end-to-end medical billing and coding solutions can meet all your needs, from following-up on pending medical claims, to getting reasons for denying claims, tracking receivable balances, or initiating collections. Our medical coders can code the healthcare diagnosis, procedures, medical services, and equipment to the relevant codes using the standard coding guidelines, including CPT, ICD-10-CM, and HCPCS Level II, etc. They are apt in medical record documentation and can provide an excellent transcription of the physician's notes, laboratory, radiology results, etc. We can support you with AR calling, initiating collections, tracking outstanding receivable balances by patient and date, following-up pending claims, finding the reasons for claims denials, etc. Our AAPC-certified medical coders know the finer points of both procedural coding and diagnostic coding. We have specialized resources and tools to handle the denial management. We can identify the key reasons for denials and draw patterns specific to the healthcare facility. We can completely examine your billing procedures and then, start fixing the denials, leading to more reimbursement. Our medical claims processing services encompass a plethora of sub-services, including patient demographic entry, document scanning, adjudication of claims, preparation of explanation of benefits, submitting and filing claims, claims follow-up, etc. Our medical claims processing services can help you significantly reduce the volume of claims rejection. To receive accurate, real-time information about the patients, the doctors need an expert tool that they could rely on. And health information management system is one of the solutions that help the doctor to access the patients' information in the manner they want, traditional or in a digital format. We can help you with clinical documentation improvement, medical auditing, etc. Our healthcare consultants are adept in handling any type of healthcare consulting requirement, irrespective of its complexity or size. We also offer healthcare consulting services that encompass, medical transcription, data security, healthcare analytics, claims processing, delivery systems, etc. We provide practical solutions that cater to both the regulatory and commercial standards faced by healthcare providers and IT vendors. We work with healthcare providers, clinics, hospitals, physicians, etc. to collaborate on health IT projects. We can update/upgrade your in-house technology, provide on-site support, data migration services, etc. 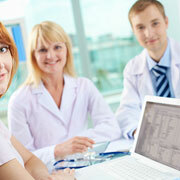 Why Offshore Back-office Support Services for Medical Billing Companies to Outsource2india? O2I is an ISO 9001:2000 certified organization and strictly adheres to the compliance regulations of HIPAA and HL7 standards. We follow the policies of HIPAA at each stage of the support service. The medical records' access is only on the need basis. No two professionals have access to same folders. We are an ISO 27001: 2013 ISMS certified company. It confirms our commitment to establish, implement, and advance the information security management system within the periphery of the organization. It also compels us to secure your legal, personal, financial, technical, or business-related data. We provide our client with highly flexible pricing options. Our services can be customized as per the client's requirements and the client has to pay only for the services they have availed for. This helps in reducing overhead costs and boost the organization's revenues. We have a combined experience of 20+ years in the healthcare support service domain. Our medical support experts exceed 200 in capacity, and our total management experience beats 100+ man-years. Our workplaces have modern equipment and infrastructure essential to provide healthcare support services. We have cutting-edge IT redundancies, 200% power backup, firewall & intrusion detection technology, VPN technology, autonomous Internet Leased Circuits, etc. It allows us to deliver quality offshore services on time. We can reach our global customers by leveraging the expertise of the local market with our five different delivery centers. It allows us to provide world-class support services. We provide round the clock support with a dedicated support team accessible 24*7. Our agent will be always available for calls or chats during your work hours, regardless of the work time variance. We have the required bandwidth of resources, both in terms of expertise and tools to handle any spike in the deliverables. This way you only need to pay for the rendered services. We believe in rendering individual attention to all our customers. That is the reason why we arrange a dedicated project manager who will also act as your one-point contact and can provide complete attention to your project. We plan all our healthcare support services in advance that eliminates any risk of delay. Moreover, we have an extensive pool of resources who can manage any deadline pressure, if that happens. Our services helped the client reduce administrative costs, increase operating efficiency, and improve employee turnover and cash flow. I want to express my sincere appreciation for the dedication you have shown to us; truly a blessing and I thank you. Outsource2india has been a leading provider of RCM, Medical Billing & Coding, AR Management & Follow-up, Denial Management, Medical Claims Processing, Adjudication, and many other healthcare support services. Our healthcare support team comprises some of the most talented billers & coders, reimbursement experts, healthcare insurance support executives, etc., who can improve your facility's cash flow and streamline the administrative operations. You can also depend on us to improve your organization's efficiency, enhance your employees' utilization, and increase the reimbursement rate. If you are looking for a dependable, accurate, and cost-effective back-office support services for medical billing companies in India, then, look no further. For outsourcing back-office support services for medical billing companies, get in touch with us today!